A thin coat of wax can, but does not necessarily have to, be applied after the wood has been oiled. Applying such a coat results in better protection and a satin surface that feels very smooth. Regular rewaxing will be required, especially around the neck. Fortunately, this is not a difficult job at all, and it ought to be part of the routine maintenance and care of your instrument anyway. 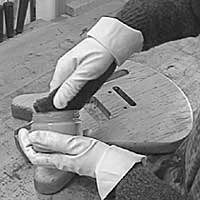 Pure beeswax or any commercially available paste wax are suitable for use on guitars. Lightly wet the oiled surface with lacquer thinner or mineral spirits. Then dip a folded-up piece of 0000 steel wool or a synthetic alternative such as 3M's ScotchBrite into paste wax and rub it evenly onto the surface, pressing only lightly to avoid rubbing open the thin, hardened topcoat of oil. By roughening up the surface with steel wool the surface is made larger so that the wax coat bonds to it better. After applying the wax use a clean cloth to polish the surface to a flat sheen. If too much wax has been applied, the surface will become sticky and everything but a wafer-thin layer will have to be polished off.